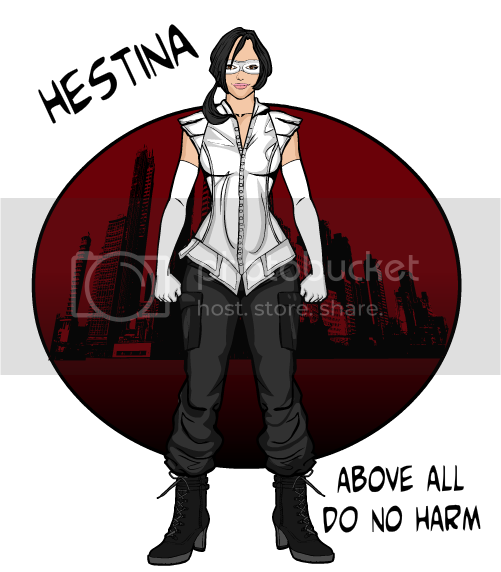 Hestina is a young pacifistic hero in training who boasts dimensional powers as well as some limited mental abilities. She maintains a secret identity as Vicki Adams who is a student at the prestigious Claremont Academy and is mute. Hestina started her career under a different Nome de Plume, Siren. However that career ended very quickly as the real Siren met with her and convinced her that she should really look to operate under another name. With some coaching and help, she changed to the name Hestina and began her career as a hero stopping small crimes. However, fate, and her father’s transfer to Loney Point Naval Base saw the young hero enrolling in Claremont Academy where she is pursuing both an education and further training for her abilities. Much of Hestina’s motivation comes from the very real examples her father set in the Navy SEAL’s. He won several awards for bravery and is an iconic figure in the service. However, her own personality seems to be geared to helping people and while her father found home in the service, the advent of her powers opened doors too her that would not have been otherwise available. Hestina favors an outfit that has the colors of her namesake butterfly, black and white. Currently, she favors functional and durable cargo pants loaded with pockets for things that she might need. Her top is a heavy leather vest that covers her torso and provides some protection and certainly modesty required in a super powered battle. Finally, she has elbow length white gloves and a white mask to complete the outfit. Everything she has, is reasonably priced and easily acquired. Hestina has two major powers which manifest themselves in different ways. The first is a tactile telepathy. Currently, that ability is very weak, but it does allow her to communicate with others if she’s touching them. Additionally, she has learned to incapacitate people via touch my overloading their minds with volumes of noise. She is rather cautious about any use of her mental powers as many people view invasion of the mind as worse than most crimes that could be committed. Her second power is the ability to manipulate dimensions on a local level to both move short distances by bending space, or creating permanent pockets which she can access as needed. She has carved out a small semi-permanent home in the dimensional space that she uses to transport things, house her stuff, and hang out in when she wants some privacy. · Siren: Hestina started out her hero career naming herself Siren in a self-deprecating nod to her inability to speak. The actual Siren, sympathetic to a new hero and perhaps feeling bad about making her change her name, took Hestina under her wing. · Monica Rausa: Best friend, and chief conspirator in most inappropriate hijinks. The second half of the Gremlin Marauders. A Voice of the People – It’s a first day at school and Vicki meets some of her fellow Claremonter’s. Buddies a Brewing – What would a boarding school be without roommates? Vicki meets her Claremont roommate and fellow teen hero Cerulean as they get to know each other. A Welcome Lunch – Food is important, and especially important when you have a metabolism that seems to burn calories like a raging inferno. Vicki meets up with fellow foodie Miracle Girl as well as Sakurako and her roomie for lunch. April Showers Bring – What is the point of going to school to be a hero if you can’t actually be a hero. A floundering freighter begins to go down in the stormy waters off the coast. Hestina teams up with Endeavor and Miracle Girl to save the crew and ship! What a Strange Trip - Claremonter's go out on a survival campout!